Ok ok i know an Iron is not exactly cutting edge hardware and may not be suitable for an I.T. blog. 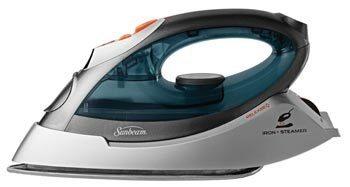 However, my current iron is pretty crappy and i’ve always considered getting a steamer. This is the best of both worlds and the reviews are pretty good. Get it from amazon here. The Sunbeam Convertible Iron + Steamer offers all the benefits of a full-featured iron. The full-sized steam iron features a stainless steel soleplate for an extra-smooth glide. With five fabric-specific heat settings, an ergonomically designed handle and a 360-degree tangle-free swivel cord, the Sunbeam Convertible Iron + Steamer makes ironing effortless. A powerful Shot of Steam button provides an extra burst of steam for stubborn wrinkles. Rotate the release knob and the top portion of the iron detaches to become a lightweight but powerful fabric steamer. Unlike other brands, the Sunbeam Convertible Iron + Steamer has an internal electrical pump that provides continuous steam to smooth away wrinkles. The Shot of Steam feature can also be used for an extra burst of moist heat when tackling stubborn wrinkles. With a large water tank and three variable steam settings, use this versatile steamer for clothes, drapes, tablecloths, bedding and more. A convenient Fabric/Lint Brush accessory is included. For added peace of mind, the 3-way Motion Smart Auto-Off shuts the unit down if left in one position for too long. The iron’s powerful pump penetrates deep into fabrics to release tough wrinkles. Most irons use gravity to create steam, but the Sunbeam Convertible Iron + Steamer has the latest technology in ironing–a high performance electrical pump to force steam deep into your fabric. For over 100 years, Sunbeam has offered families practical solutions for everyday living. Through generations, the company has introduced innovative products that simplify consumer lives and offer high value. Since the introduction of the first Sunbeam iron in 1910, the brand’s irons have earned a reputation for extraordinary performance and reliability. NextGoogle makes Car that drives itself.